There's a popular saying in western Rajasthan Jaankhiyon laare meh. Loosely translated, it means a good rain always follows dust storms. This summer when Rajasthan's Jaisalmer and Barmer districts witnessed dust storms, people thought it augured relief after six years of drought. The rains did come but the boon fast became a bane. Barmer was deluged with 750 mm of rainfall in the last week of August five times the district's average annual rainfall. Floods also ravaged arid Gujarat, and neighbouring Maharashtra, while usually-wet Assam reeled under droughts, causing many experts to argue that climate is changing. "Extreme weather events occur in cycles. But worldwide, the frequency of such extreme events is increasing because of climate change," says environmentalist Anupam Mishra. Similarly, in July 2003, un's World Meteorological Organization had warned of an increase in frequency of extreme weather events because of climate change.The deluge in Rajasthan was caused by a low pressure zone over the area, itself a result of extreme heat conditions, experts note. Low pressure area in deserts that results from extreme heat is referred to as 'thermal low' in meteorological parlance. Such conditions could be caused by global warming, experts reason. "The thermal low caused southwest monsoons to bring rain over Barmer and Jaisalmer," says Rajeevan M Nair, director of National Climate Centre, Pune. Another school of thought ascribes the exceptional rainfall to Rajasthan's usual weather cycle a good monsoon usually follows three or four years of drought, but there is excessive rainfall and flooding, once in 75-100 years. 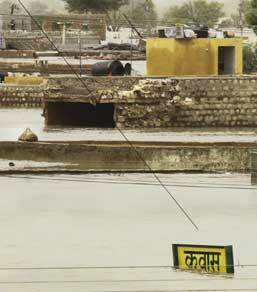 Barmer received 720 mm of rainfall in 1990 and in 1994, 600 mm rain fell over the district. But such inordinate rainfall was spread over a year. This time, the downpour was a weeklong affair and was compounded by rainwater flow from neighbouring Jaisalmer. Elderly people in Barmer say that rainwater took the drainage route of rivers that once passed districts Rohali and Nimbala. These now-extinct rivers originated in the Jinjhiniali region in Jaisalmer, merged in Luni River before entering Barmer, and finally disappeared into the Rann of Kachchh in Gujarat, they say. Water gushing down the Rohali-Nimbala route drowned Kawas town and villages en route, the villagers maintain. Rainwater from Jaisalmer also took the drainage path of the extinct rivers, Leek and Sheepasaria -- they add. Water that came along this path caused havoc in Maluva village. 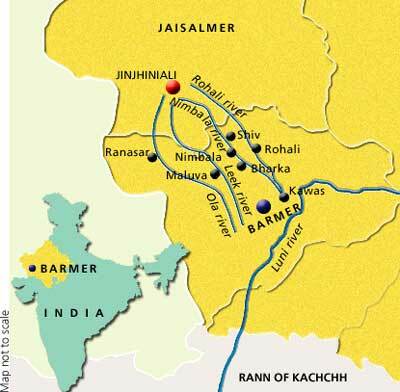 There is no documentary proof of the rivers mentioned by Barmer's residents. But experts do not rule out their theories. "It's quite possible that developmental activities have disturbed the drainage path of these rivers, and water accumulated in Barmer," says Mishra. He also adds "Barmer's subterranean layer of gypsum prevented rainwater from seeping down or draining away." Geologists trace the gypsum layer to a big lake that occupied much of present day Barmer, some 1,000 years ago. The dried up water body has also left behind a zone of depression in the district that renders drainage difficult, they say. Barmer's vast network of reservoirs and anicuts -- used for drought relief (see box The rich tradition) -- was swept aside by rainwater from Jaisalmer. The reservoir water contributed to the spate, making the district resemble a cluster of lakes. The deluge also made Megha Ram -- a 96-year-old resident of Kawas village in the district -- recall a similar event, 75 years ago. "The village did not have much human or livestock population then. So, there was little damage. The scale of flooding was also much less," he said. "The village was deluged with ratadiya magra (red-coloured river in local language)," he reminisces. Floodwaters had a similar colour this time as well, but that was only initially. Heavy rains diluted the red colour derived from red stones in Jaisalmer, subsequently. Kawas and Maluva were the worst hit by the floods. Houses here are still 15 feet (about 4.5 metres) deep in water. Ironically, the region's rich gypsum deposits have become a curse for it. The authorities are now discussing options to drain out the floodwater. These include breaking the gypsum layer and boring into the earth. But, environmentalists oppose this option it will contaminate groundwater and affect reservoirs in the region, they fear. Authorities also have another proposal on their anvil diverting the water to other areas, either through canals or by pumping it out. Whatever the option, it will take at least a month to drain out the floodwater, authorities say. Barmer has become the focus of attention for scientists, environmentalists and ecologists across the world. And not all of them have bad news. Many environmentalists feel that the terrible costs notwithstanding, the floods could be a boon for the region. Floodwaters might increase the region's groundwater level in long run, they feel. Oil companies operating in the region aren't too unhappy either. Experts believe when floodwater seeps down, it will force oil to move up. But that's the future. Despite heavy rains and floods, Barmer is thirsty and will remain so for sometime, say experts. The flood has destroyed the area's water harvesting structures like the tankas and anicuts. "The villagers have to build all of them once again," says Farhad Contractor, head of Sambhaav, an Ahmedabad-based ngo working in Barmer. Crops worth Rs 1,000 crore have been destroyed and the floods have claimed 140 people, and 50,000 livestock. 39 people have died in Maluva alone. "We have lost every thing livestock, crops, house," Ghazi Khan a resident of the village said. Livestock are the only source of sustenance for many like him. Floodwater has also forced snakes and other rodents into the open snakebites have increased. The authorities also fear epidemics.